This guide was created by Lisa Davies, former Access Librarian at the IALS Library. 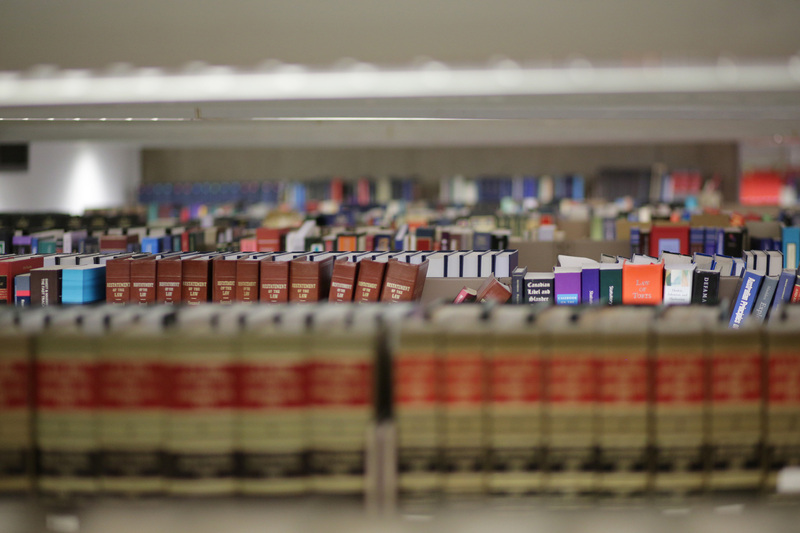 At IALS library books are organised by jurisdiction or by subject, and are arranged by author within this subdivision. They are represented by a classmark (sometimes called a shelfmark) - a combination of letters and numbers indicating their location in the library. A more detailed outline of the arrangement of books can be found in the guide Classmarks and the Location of Resources in the Library. If you are looking for a specific book it is much quicker to look it up on the catalogue, find out its classmark and then go to the shelf, rather than to just browse through the books at the shelves. You can run a Title or Author search on the Library Catalogue, or a combination of both. 1. Go to the Library Catalogue and select Title or Author. Once you've run your search, you can use the "Limit/Sort Search" option on the results page to modify your search to include, for instance, year of publication. 2. If your search is successful note down the classmark and use the floor directories or the guide Classmarks and the Location of Resources in the Library to locate the item. 3. If your search is unsuccessful, try a Keyword search. 4. If your search is still unsuccessful, check whether the title is held at another library (see Finding books not held in the Library below). If you are not looking for a particular item, but would like to check the library's holdings for a particular subject, run a Subject, Keyword or Classmark search on the Library Catalogue. This searches across the controlled subject headings of each item on the library catalogue. 1. Go to the Library Catalogue and select Subject. 2. If your search is unsuccessful, try a Keyword search. When you have found a book on your desired topic, take a note of the subjects listed on the catalogue record for that book. You can use these subjects for subsequent Subject searches. This searches across the entire catalogue record, so can be useful if your Title or Subject search does not bring back any results. - Go to the Library Catalogue and select Keyword. In many cases core textbooks will have a number of editions published in different years. Once a new edition has arrived in the Library the previous edition is removed from the open-access library shelves and placed in the Library's basement store. These earlier editions are identifiable by having a depository number for a classmark on the Library Catalogue. The most recent edition will have a recognisable Library classmark eg Short Loan or GA2.C.1 JOW. 3. Click on 'sort' button. This will list all of the items with the most recent edition at the top. If you find that all of the editions which your search turned up have depository numbers it may be worth re-submitting your search as a keyword search in order to find the most recent edition. The catalogue will tell you where to find a book by giving a classmark or a location statement. Given below are examples of classmarks, prefixes, filing marks, and location statements. RES: This means that the book is in the Basement Store. See below. FOL: Shelved in a separate sequence of large sized books to save space. Consult the Library map to find the FOL books on each floor. PAMP: A pamphlet shelved in a box at the end of the run of books with the same classmark. All these prefixes can be combined, as in the examples above, so that RES FOL PAMP would mean a large sized pamphlet kept in the Basement Store. These always come after the classmark and consist of three letters, usually the first three letters of the author's name. Within each classmark, books are shelved alphabetically by this filing mark. DEPOSITORY: Kept in the Basement Store. To obtain a book with this location statement, please complete a blue Basement Collection Slip available at the Enquiry Desk and hand it to the staff. The depository number must be noted on the slip. IALS OFFSITE STORE: Kept in an offsite store. A fetching service is available for this material which may take a day or two to retrieve. To obtain a book with this location statement, please complete a collection slip available at the Enquiry Desk and hand it to the staff. The classmark must be noted on the slip. SHORT LOAN: Heavily-used material kept in the SHORT LOAN COLLECTION behind the Enquiry Desk. Request textbooks by author and/or title. There is a time limit on the use of items from this collection. THESIS: Kept in the Basement Store. Please apply to staff at the Enquiry Desk. Request volumes by thesis number. ORDERED: Item currently on order from the publisher. The Library has not yet received it. IN PROCESSING: Item has been received from the publisher, but is still being processed. Apply to staff at the Enquiry Desk. 1. Choose the option on the drop-down menu on the front page of the catalogue to search "All Collections (Senate House Libraries + SAS libraries)" and run your search again. You may need to visit another library to obtain the material which you need. Alternatively you may be able to obtain titles from libraries using the interlibrary loan and document delivery services offered by the library at your institution. Brill Online: international law books for 2015, 2016, 2017, 2018. Human rights law books for 2017 and 2018. All of these databases can be accessed through our Electronic Law Library and many can be accessed remotely too. Click here to find out if you are eligible for remote access. In addition to the above, IALS has secured access to individual e-books from a variety of publishers. They can be accessed from the DawsonERA link in the Electronic Law Library or from the individual book record on the Library Catalogue. If you are looking for a book that we do not have in our collection, you can recommend that we purchase a copy. We cannot promise to buy everything that is recommended, but we will consider all recommendations.